This exquisite, handcrafted, Spanish colonial style bed can be accompanied with our La Negra Antiqua 2 armoire (Arm03A) and with our La Negra Antiqua end tables (Etbl06). The top of the headboard has a staggered, crown molding, and the center of the molding is slightly arched. On each end of the crown molding is a beautiful, solid wood, hand turned ball. The front of the headboard has three, geometric shaped panels, and the arched, center panel is the largest. Each panel is covered with hand hammered copper, and the outer border of each copper panel is hand tooled with luminous, copper designs. The headboard is framed by graceful, hand turned, solid wood, spiral uprights. The footboard has a crown molding, and below the molding is a rectangular, hand hammered, copper panel with hand tooled details. 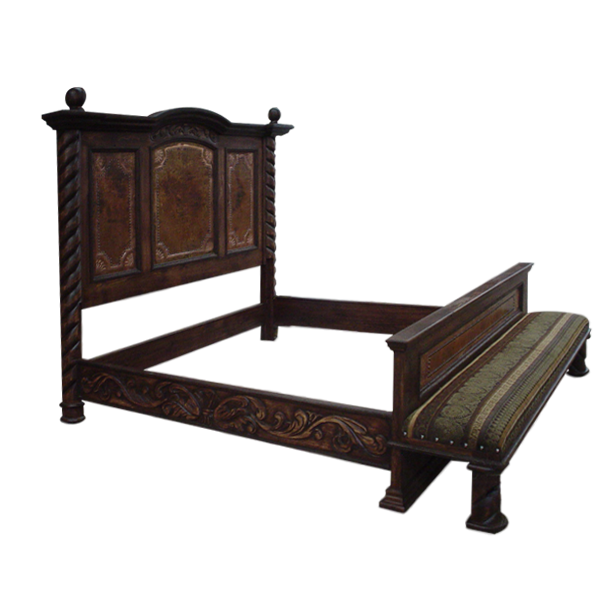 Attached to the footboard is a bench, and the bench is upholstered with fine, patterned fabric. The fabric is hand tacked to the frame with large, decorative, gilt nails, and the bench rest on robust, solid wood legs. The sides of the bed are embellished with exquisite, hand carved, floral and scroll designs, and the bed has a classic finish. It is made with the best, sustainable, solid wood available, and it is 100% customizable.